The North Carolina man visited by armed EPA agents after sending an email to a controversial agency official says he not satisfied with the explanations about what he considers an excessive response and that he wants changes to agency policies and procedures. “This isn’t over,” Keller said. He told Fox News.com that Environmental Protection Agency officials have said the agency followed procedures and that the agents acted appropriately during their visit last month. However, Keller is still invited to come to EPA headquarters to discuss the situation. Al Armendariz, Americans reject Socialism, “philosophy of enforcement”, Democrats, economy, environment, Environmental Protection Agency, EPA, federal bureaucracies, government, Marxists in the White House, Obama, politics, Range Resources, Solyndra Inc.
Al Armendariz was appointed as an Environmental Protection Agency official by President Barack Obama in November 2009. Well, hot diggity dog. At least one mean-spirited, overzealous Washington regulator got what was coming to him this week. 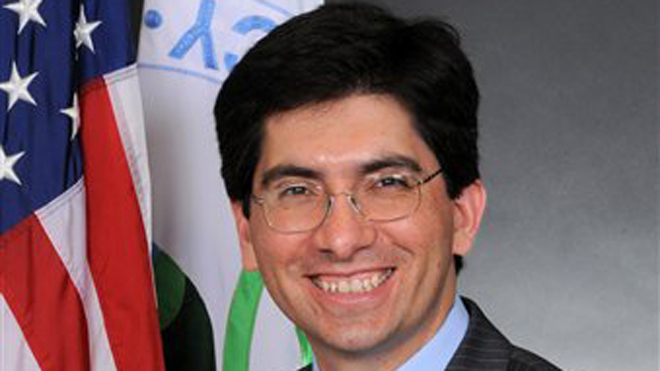 Al Armendariz, a regional director of the Environmental Protection Agency, was forced to quit his job when some of his intemperate remarks got publicized. It would be great if the same thing happened to a few thousand of his fellow bureaucrats. Armendariz was in charge of enforcing EPA regulations in Texas, Oklahoma, Arkansas, Louisiana and New Mexico. He was appointed to his post in November 2009 by President Barack Obama and quickly demonstrated a zeal for the job. He was infamous for his office’s harsh prosecution — many would say persecution — of any company that fell afoul of EPA regulations. It was kind of like how the Romans used to, you know, conquer villages in the Mediterranean. They’d go in to a little Turkish town somewhere, they’d find the first five guys they saw, and they’d crucify them. And then, you know, that town was really easy to manage for the next few years. That’s a pretty chilling and cold-blooded attitude, wouldn’t you say? Notice that guilt or innocence has nothing to do with Armendariz’s methodology. All he’s concerned about is how quickly and how ruthlessly he can intimidate his subjects.